The fake news website America’s Freedom Fighters has identified itself as part of the extremist militia movement The Three Percenters (also referred to as the Three Percent movement and III%), which has been implicated in multiple cases of race-based violence. Some pages that are part of America’s Freedom Fighters’ popular Facebook network bear the name or the logo of the militia movement in their name or profile pictures. In its principles, The Three Percenters state that they are not “the aggressor” and have a “don’t fire unless fired upon” policy. However, local level groups and militiamen affiliated with the Three Percenters movement have been implicated in multiple instances of domestic terrorism and racist violence over the past few years. Members of the Three Percenters, along with other militia groups like the Pennsylvania Light Foot Militia and the Oath Keepers, provided security for the white supremacist Unite the Right rally in Charlottesville, VA, in August 2017. The Three Percent United Patriots has operated as a border militia that “hunt[ed] Mexicans”while profiling and targeting Latinos passing through the U.S.-Mexico border. A member of the Three Percenters militia was arrested before attempting to detonate a bomb outside of a bank in Oklahoma City. And Three Percenters from Idaho and Oregon joined Ammon and Cliven Bundy’s armed occupation of the Malheur National Wildlife Refuge in 2016. Muslims and Muslim community spaces are frequent targets of state and local level Three Percenter groups. One of three arrested suspects in the bombing of a Minnesota mosque in March was identified as the head of the group White Rabbit Three Percent Illinois Patriot Freedom Fighters Militia. In 2016, the North Dakota Security Force III% published a since-removed video of a model of a mosque being shot at and blown up. Multiple Three Percenter groups have organized armed protests targeting mosques in Georgia, Texas, and Kansas (where the group goes by both Kansas Security Force and Kansas Three Percent Security Force). America’s Freedom Fighters has promoted the Three Percenters movement on its website and Facebook accounts. The fake news site reprinted the Three Percenters’ oath from their bylaws in an article titled “We Are The Three Percent!” (These are also the same bylaws that the radical anti-government militia groupthe Oath Keepers has adopted.) In this article, America’s Freedom Fighters also promoted its Facebook pages and a large Facebook group for Three Percenters. In another article, America’s Freedom Fighters praised The Three Percenters for “securing the U.S.-Mexico border” after the militia threatened to kill immigrants as they approached the border. 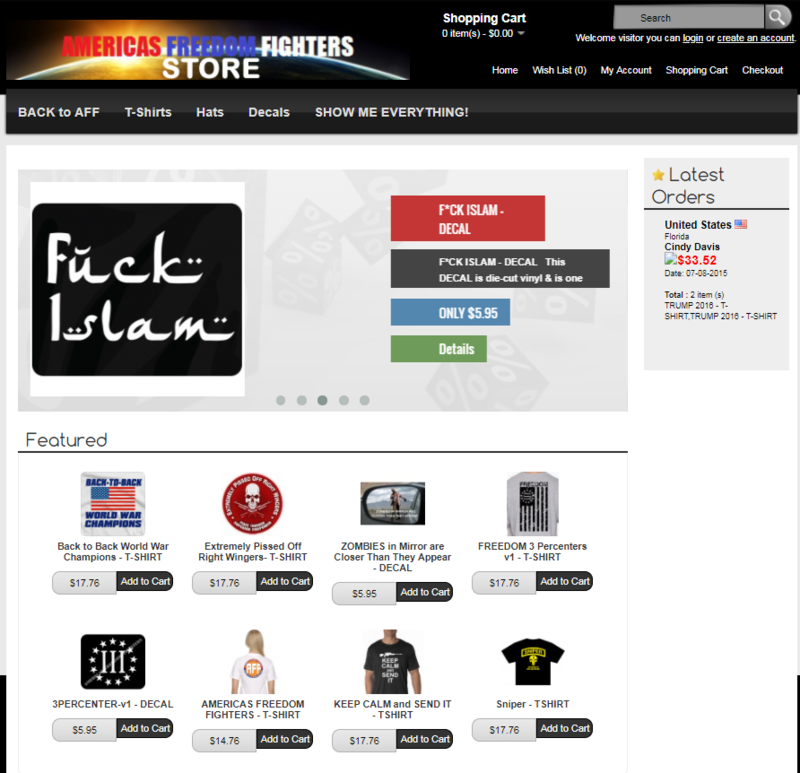 America’s Freedom Fighters’ now-inactive online store also used to feature merchandise with the Three Percenters’ logo. Some Facebook pages affiliated with America’s Freedom Fighters reference The Three Percenters in their names and profile pictures. These pages include: Dean James III%, Nation in Distress, USA in Distress, and The voice of the people. According to data from Crowdtangle, the most popular of these pages — Nation in Distress — earns an average of over 412,000 interactions a day. 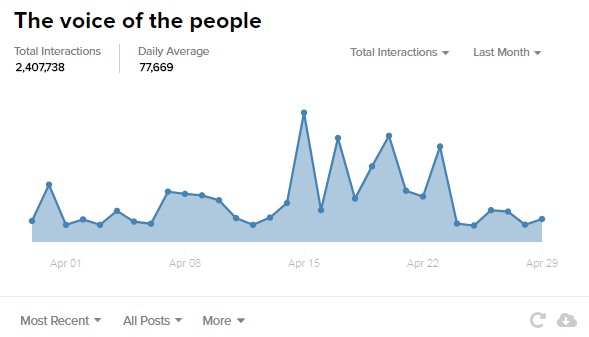 Dean James III% and The voice of the people earn over 72,000 and 77,000 daily interactions, respectively.